Foundations for Multilingualism in Education: from Principles to Practice equips pre-service and in-service educators with the knowledge and skills they need to make informed decisions about educating English language learners (ELLs)/bilingual learners in bilingual education and general education contexts, with an emphasis on promoting bi/multilingualism creatively and effectively in diverse settings. De Jong also highlights the role of teacher as decision maker, and shows multiple pathways for teacher advocacy at the classroom, program, school, and policy levels. A note on terminology. The terms "multilingualism in education" and "multilingual schools" refer to schools with students from two or more language backgrounds, including (a) bilingual eduction programs serving bilingual communities, (b) general education programs that include ELLs/bilingual learners from linguistically and culturally diverse backgrounds, and (c) educational programs that aim for multilingualism as a goal and anticipated outcome for students. This comprehensive text supports an important move in educating ELLs/bilingual learners: All educators, not just those who work in bilingual education programs, need to be prepared to look at educating ELLs/bilingual learners from a bilingual perspective. 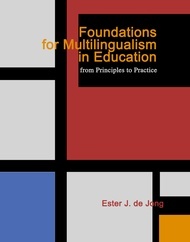 Using rich examples from classrooms and schools, de Jong clearly shows how these four principles are enacted and reflected differently in bilingual education and general education contexts. She also invites teachers to apply these principles to their own practice, and to use their findings to inform their own advocacy efforts.